The Best Messages to send to your Male Friends leaving for College! The Best Messages to send to your Female Friends leaving for College! 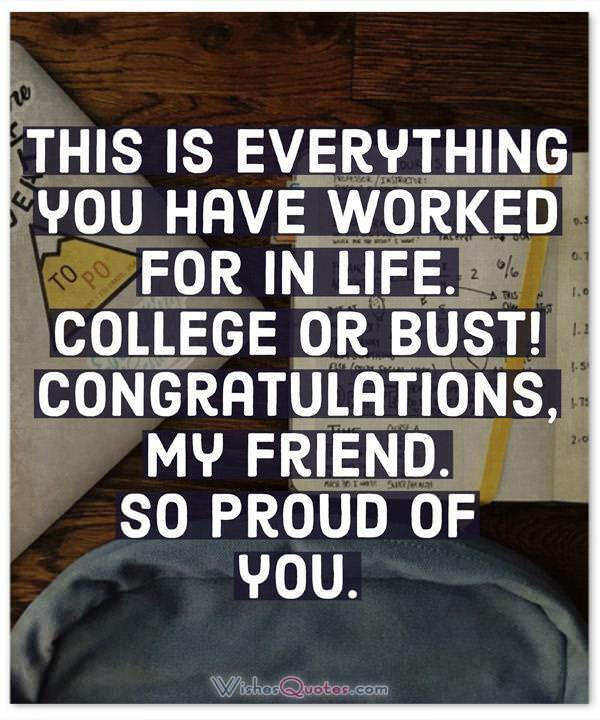 Browse through our collection of congratulation messages to send to your friend who is going to college! There finally comes a time in every young person’s life that they have to leave home to chase their dreams. For most, the university is the best place to start! So, shortly after high school is over and there are a large number of positive emotions in the air, comes the harsh realization that you have to wander off to different routes and part ways. All those feelings clamping up together make it very difficult to be mustered into words. Worry not! This is why we are here for! We have provided you with the best ways you can put all those emotions into words to get the message across! I will miss you and so will all of the gang. Go and do us proud. You have been closer to family than a friend to me; I don’t know what I would have done without you in my life. Thank you, and I wish you the best in your new life as a university student! The world is your oyster. Do good, and share the best as you always have. Congrats, my dear friend. I feel blessed to have had you in my life as my best friend. You made my days in school not only tolerable but enjoyable. I am going to miss you a lot, and I hope that you achieve everything you have set out to do on this new journey you are about to embark on! Wit, wisdom and a kind heart will get you through the next four years as you face college life. You have all those in spades, so you’ll do just fine. Good luck! They say that curiosity, passion, and congeniality are characteristics that will help you thrive in college. You have those in spades, so I expect nothing but good news from you. Way to go, buddy! You will be missed no matter how far you go, but go on. Make us proud. Good luck on this four-year road trip called college. You will do great as you always have. As far as bros go, you always were one of the best! Friday nights won’t be the same anymore with you on that football field! It was always a blast having you around in high school, and I’m sure that you won’t have any difficulties going through university! Have fun and good luck! We’ll miss you. Don’t drink and drive. You are too precious to so many, and we want to see you in four years – successful and triumphant at having survived the college years. If there is one thing that I want you to promise me, is that you won’t drink as much as you do when we hang out after high school! Going through university is tough, but I’m sure that you’ll manage just fine! I’ll miss you. You are one of the most graceful and charismatic people I have ever met. I can say with no doubt, that you will be missed! I hope that you succeed in everything you set your mind at. Going to college is an experience like no other. It’s where you discover yourself and find out you truly love. In both the good and the bad though, I’m more than confident that a responsible young woman like you will have no issues going through it! I’ve never seen a girl as beautiful and intelligent as you. You have always been a person I’ve admired, and I’m sure that I’ll miss you now that you’re gone! Have fun and good luck! Friends don’t let friends go off to college without some sage advice. Be brave, be strong and be wise. You will be a smashing success. They say curiosity killed the cat, but I don’t see you having paws and a tail, so I guess that you’ll be fine! Always be curious! This is how you’ll go ahead in this new college life that unfolds in front of you. Congrats on this thing called college. It will take all of four years and maybe even longer. But you will always be here in my heart. This is everything you have worked for in life. College or Bust! Congratulations, my friend. So proud of you. I’ll always be here to take your phone calls if you ever feel homesick. I will be in same time zone, no matter where you may be. Good luck with being a college kid now, my friend! Against all the odds, you made it to college. Congratulations all around, and may you live long and be world-famous. I always knew you were special. 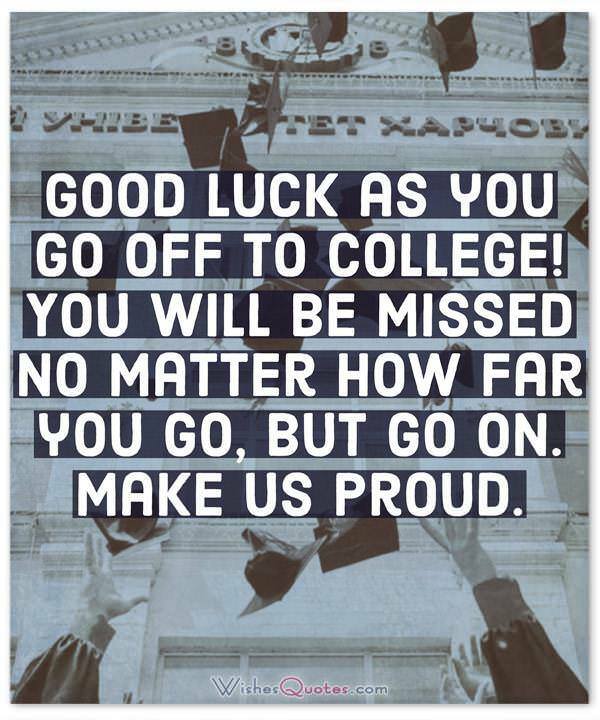 Wish you all the best as you take on the challenges of college life. It took a lot of work to get where you are and a lot more work to get where you really want to go. I’m here if you ever need a sympathetic ear and a shoulder to cry on. 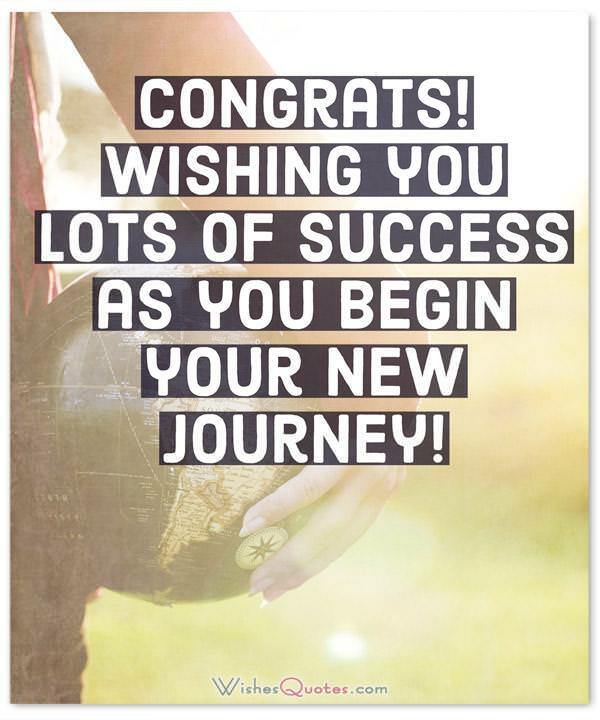 Happy wishes on your college journey. You have always been an excellent example for hope that continues as you become a college boy/girl. I know that we had tons of fun in high school, but this where we have to take our path, destined to new encounters, on the way of becoming the people we’ve always dreamt of being. Take care, my friend! I know you’ll be far away, achieving your dreams, but don’t forget to text once in a while! We’re still friends you know; distance is just an illusion. You were always a great student, on top of being a great friend. I hope you find great happiness in your new life as a college student and that you meet new people that can be as great friends as you’ve been! As long as you remain diligent in your studies and unwavering in your conviction of pursuing your dreams, I’m more than sure that you will go through college without any difficulties! When it comes to socializing, I never was afraid of you; I know what a great friend you can be! The beginning might be rough, as adjustment periods tend to be. What you must never forget though is that this is a very important step for you and I’m more than sure that you’ll be perfectly fine! Good luck my friend! The rung of a ladder was never meant to rest upon, but only to hold a man’s foot long enough to enable him to put the other somewhat higher. By Thomas Henry Huxley, Life and Letters of Thomas Huxley. College is the best time of your life. When else are your parents going to spend several thousand dollars a year just for you to go to a strange town and get drunk every night? By David Wood. Don’t ever dare to take your college as a matter of course- because, like democracy and freedom, many people you’ll never know have broken their hearts to get it for you. By Alice Duer Miller. I learned three important things in college – to use a library, to memorize quickly and visually, to drop asleep at any time given a horizontal surface and fifteen minutes. By Agnes DeMille. Of course, there’s a lot of knowledge in universities: the freshmen bring a little in; the seniors don’t take much away, so knowledge sort of accumulates. By Abbott Lawrence Lowell. It takes most men five years to recover from a college education and to learn that poetry is as vital to thinking as knowledge. By Brooks Atkinson. The purpose of primary education is the development of your weak characteristics; the use of university education, the development of your strengths. By Nevin Fenneman. The reason most people do not recognize an opportunity when they meet it is that it usually goes around wearing overalls and looking like Hard Work. By Unknown Author. There isn’t a child who hasn’t gone out into the brave new world who eventually doesn’t return to the old homestead carrying a bundle of dirty clothes. By Art Buchwald. If you feel that you have both feet planted on level ground, then the university has failed you. By Robert Goheen. You know that it is only through work that you can achieve anything, either in college or in the world. By Charles William Eliot. When solving problems, dig at the roots instead of just hacking at the leaves. By Anthony J. D’Angelo, The College Blue Book. Wherever you go, no matter what the weather, always bring your own sunshine. By Anthony J. D’Angelo, The College Blue Book. Don’t aim for success if you want it; just do what you love and believe in, and it will come naturally. By David Frost. Here is the world. Beautiful and terrible things will happen. Don’t be afraid. By Frederick Buechner. Learn as much as you can while you are young since life becomes too busy later. By Dana Stewart Scott. The best helping hand that you will ever receive is the one at the end of your own arm. By Fred Dehner. Obstacles are those frightful things you see when you take your eyes off your goal. By Henry Ford. While I was (in college) I was exposed to this world that I didn’t know was possible. By Tom Hanks. Don’t live down to expectations. Go out there and do something remarkable. By Wendy Wasserstein. There is no telling how many miles you will have to run while chasing a dream. By Unknown Author. Try not to become a man of success, but rather try to become a man of value. By Albert Einstein. College is a place to keep warm between high school and early By George Gobel. What we are is God’s gift to us. What we become is our gift to God. By Eleanor Powell. If at first, you don’t succeed, do it as your mother told you. By Unknown Author. Learning is a treasure that will follow its owner everywhere. Chinese Proverb. Shoot for the moon. Even if you miss, you’ll land among the stars. By Les Brown. As long as there are tests, there will be prayer in schools. By Unknown Author. Education is not preparation for life; education is life itself. By John Dewey. Do what you can, with what you have, where you are. By Theodore Roosevelt. The roots of education are bitter, but the fruit is sweet. By Aristotle. The preparation I had in college was the most valuable. By Hayden Fry. The important thing is not to stop questioning. By Albert Einstein. You learn something every day if you pay attention. By Ray LeBlond. Excellence is not a skill. It is an attitude. By Ralph Marston. That was it! Hope you enjoyed it. I know that saying goodbye to someone is not easy, especially when you’ve formulated so many good memories together. You have to understand though that this is for the best and that you are now embarking on a journey to become the people you have always dreamt of becoming. So, as a final token of appreciation before leaving each other for some time, try to get a nice present or anything to make them remember you in the time you will spend apart.